I have an apology to make. For the last few weeks, the bird seed in our bird feeders has disappeared during the night. I am not really upset about it. Anyone who knows our household knows that the inside animals...our two elderly cats (22 years old)...and the 'wild' animals outside are well fed and safe on our property. I keep the bird feeders full, leave peanuts and corn for the squirrels, keep fresh water in containers and put left over foods (that I know some creature will like) out each evening. And, as some of you know, from a former post...even the ants are safe Something for Your Rusty Bucket List . In fact, today while bringing laundry from the basement to the bedroom upstairs...a pale tan spider came crawling from the side of the laundry basket. I searched for our 'spider jar' that we keep at such times to capture her and put her outside. It was not anywhere, so I took the basket to the end of the hall and nudged the spider onto our bedraggled spider plant. (Oh my, I just realized that I put the spider on a SPIDER plant! I do hope she stays there. But, back to my apology. I have been blaming our squirrel...well...our many squirrels as the culprits eating from the bird feeder. And I have proof! 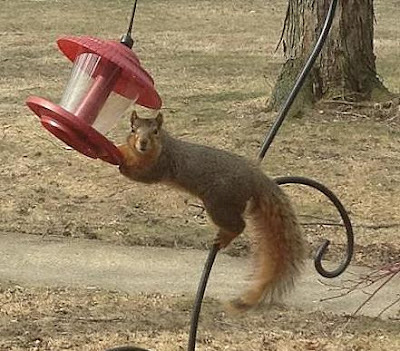 We knew the squirrels ate from this feeder, but they never ate all of the food. They seemed to know that they needed to share with the birds....that was until a few nights ago. 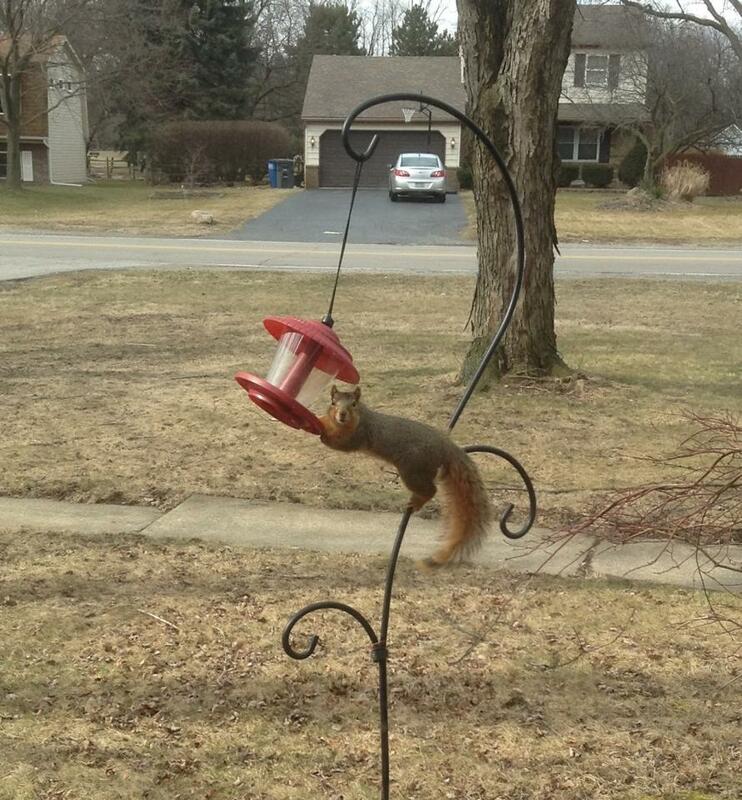 This feeder and the ones in the back yard were empty when I checked them in the morning. Those little rascals...how could they have eaten so much during the night? I had a vision of them lined up, taking turns, swinging and balancing as they grabbed the seeds and corn. Maybe it was a raccoon....even though I have not seen a raccoon since a mother gave birth to two in our chimney....after a wind storm when the chimney lid (cover, cap) blew off. The wind storm also blew down the big antenna at the side of the house which the raccoon climbed at night, peeking through our bedroom window on her way to the chimney. I did not realize at that time that there soon be a family as I thought the cap was still on the chimney. We have not seen a raccoon around here since the raccoon family found a new home somewhere in the woods. But, the missing bird feed sounds like the work of a nocturnal animal...and so the raccoons were blamed. They were gently nibbling the seed from the bird feeder...probably thinking how kind it was that we put it at lip level for them. Ray was able to get this picture. They turned, summoned the other three that were behind the garage, and ran across the yard, jumping our fence into the neighbor's yard, jumping their fence...and off to a wooded area nearby. Their beauty and grace made me forget about them eating the bird seed....but I am now taking in the feeders at dusk and returning them for the birds in the morning. And one more thing....these deer have made a meal of my tulips too! They did not eat the crocus, and the hyacinth are still blooming...but the tulips have been chewed to the ground. So....looks like no tulips this year...and this fall I will plant more crocus and hyacinth. What is left of the tulips! That blog post was written in the spring. 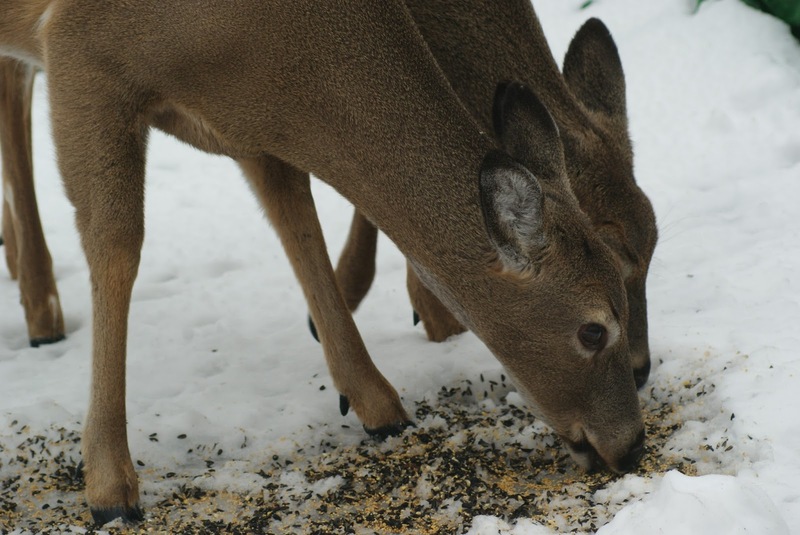 Here are two winter pictures of some deer feasting on the bird seed. The deer continue to dine in our yard. Wow...those are some hungry deer! I would have bet on the squirrels, but I know our deer eat everything. My tulips too are goners, but I love to watch the deer as they roam about our yard. And, I wouldn't apology to much to the squirrels, they do their fair share of making havoc. You've left me chuckling as I read this slice. Oh those poor squirrels to be blamed (this time). Your pictures are amazing! Isn't nature fun to watch, even as they nibble away our plants. Knowing you makes this post even better. I know you work to save every creature --- I can't help but wonder about the spider on the spider plant. 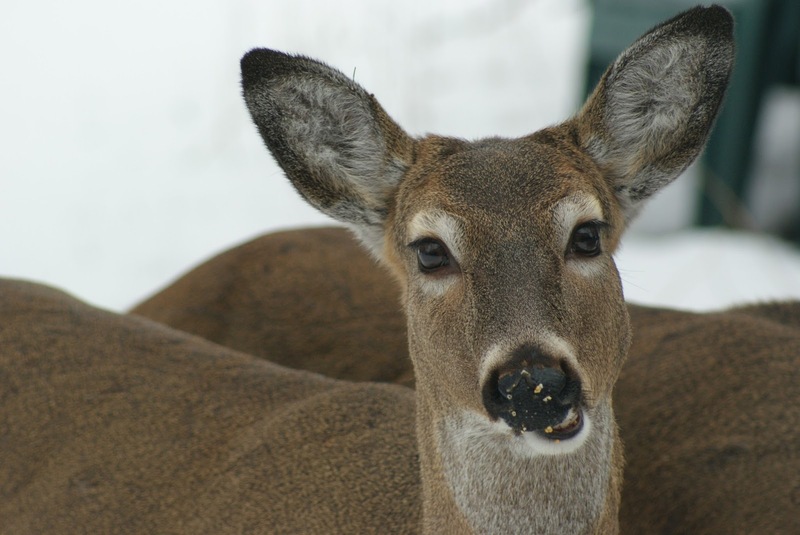 Deer can be quite bold. They probably appreciated the tasty treat you were leaving for them each evening. Way to Go, Audrey and Cooper!